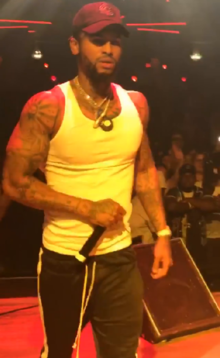 David Brewster Jr. (born June 3, 1988), better known by his stage name Dave East, is an American rapper, songwriter and actor from Harlem, New York. He gained attention in 2014 from his mixtape Black Rose. Since the release of his mixtape, East has been signed to rapper Nas' label Mass Appeal Records and has made a number of guest appearances. In 2016, East was chosen as part of the XXL magazine's 2016 Freshman Class. In September 2016, he signed to Def Jam Recordings. David Lawrence Brewster, Jr. was born in New York City and spent his life between East Harlem where his mother resided, and Queensbridge where he lived with his aunt in his late adolescent life. He is of Bajan, and [[People of the Creole descent. He played basketball, and football at Springbrook High School. Additionally, he played in the Amateur Athletic Union with then-future NBA players Ty Lawson, Greivis Vasquez and Kevin Durant. After Springbrook High School, East attended the University of Richmond, then transferring to Towson University. In 2010, he released his first mixtape Change of Plans which gained him a little recognition. He later released the mixtapes Insomnia, American Greed, Don't Sleep and No Regrets, solidifying his commitment to music. In 2013, East periodically sold drugs throughout Harlem to support himself and his music. He then released his sixth mixtape Gemini. East performing in June 2016. In 2014, his music reached the ears of rapper, Nas who quickly looked for ways to contact East. Unbeknownst to Nas, East was close friends with Nas' younger brother and fellow rapper Jungle who quickly introduced the two. By summer 2014, East was the newest signee of Nas' new Mass Appeal Records along with Bishop Nehru, Fashawn, Boldy James and Run The Jewels. In July 2014, he released his seventh mixtape Black Rose through the label, which received favorable reviews from music critics. In 2015, he released his eighth mixtape Hate Me Now with key features from well respected such as, Pusha T, Nas, Jadakiss, Styles P.
In June 2016, XXL magazine revealed their annual Freshman Class for 2016, which included East, along with other nine new artists. In August 2016, he released a joint extended play titled Born Broke, Die Rich with rapper Kur. In September 2016, East was featured on the BET Hip Hop Awards cypher alongside Young M.A, Ms. Jade, Kur and Sam Black. On September 29, 2016, he announced that he has signed a deal with Def Jam Recordings with the deal negotiated by Hip-hop executive Steven "Steve-O" Carless  and the next day released the mixtape, Kairi Chanel, which peaked at number 38 on the US Billboard 200. In January 2017, East made his acting debut, starring in BET's Being Mary Jane series. He later appeared in Puma's Tsugi Shinsei commercial and starred in rapper Trina's "It Ain't Me" music video. In August 2017, he released the Paranoia: A True Story EP, supported by the single "Perfect" featuring American singer Chris Brown. The EP has peaked at number nine on the Billboard 200. In September 2017, East hosted the first annual Goldie Awards, a DJ and producer battle set taking place in New York City. In January 2018, East released the mixtape Paranoia 2. East is known for his raw lyricism and dark storytelling about street life. He is influenced by Styles P, Jadakiss, Cam'ron, Big Pun, Nas, The Notorious B.I.G., Raekwon, DMX, Tupac, Snoop Dogg and The Diplomats. 2017 Being Mary Jane Himself Episode: "Getting Nekkid"
2017 The Breaks Hashim Episode: "Under Pressure"
^ Dave East Spits Bars with Rosenberg on Real Late. YouTube. 11 December 2014. ^ "Stream Dave East's 'Kairi Chanel' Mixtape". XXL. September 30, 2016. Retrieved January 27, 2017. ^ "Dave East - Change of Plans (Hosted by DJ Ill Will & DJ Rockst". HotNewHipHop. July 15, 2010. Retrieved July 15, 2016. ^ "How They Came Up: The Dave East Story". Indie Hip Hop. October 31, 2014. Retrieved July 15, 2016. ^ a b "Dave East Has Harlem, Nas, and the Whole City Behind Him". Village Voice. September 29, 2015. Retrieved July 15, 2016. ^ "Dave East - Gemini (Hosted by Adrian Swish)". HotNewHipHop. April 15, 2013. Retrieved July 15, 2016. ^ a b "Dave East Details Signing With Nas & Mass Appeal". HipHopDX. October 22, 2015. Retrieved July 15, 2016. ^ "Dave East "Black Rose" Cover Art, Tracklist & Mixtape Stream". HipHopDX. August 5, 2014. Retrieved July 15, 2016. ^ "Is Dave East Destined For Greatness?". The Source. July 12, 2016. Retrieved July 15, 2016. ^ "How They Came Up: The Dave East Story". Indie Hip Hop. ^ Schwartz, Danny (1 October 2015). "Dave East - Hate Me Now [New Mixtape]". HotNewHipHop. ^ "2016 XXL Freshman Class Cover". XXL. June 13, 2016. Retrieved July 15, 2016. ^ "Stream Dave East & Kur's "Born Broke, Die Rich" EP". HotNewHipHop. August 12, 2016. Retrieved September 30, 2016. ^ "Dave East, Young M.A & More Trade Bars On 2016 BET Cypher". HipHopDX. October 4, 2016. Retrieved October 12, 2016. ^ "Stream Dave East's Debut Album "Kairi Chanel"". HotNewHipHop. September 29, 2016. Retrieved September 30, 2016. ^ "Dave East - Chart history". Billboard. Retrieved January 26, 2017. ^ a b "Watch Out D-Wade! Rapper Dave East Is Gabby's Guest On "Being Mary Jane" [VIDEO]". Bossip. December 31, 2016. Retrieved January 26, 2017. ^ "Dave East Stars in Puma's Brand New Tsugi Shinsei Lookbook". XXL. April 14, 2017. Retrieved June 30, 2017. ^ "Trina Releases "If It Ain't Me" Video With K. Michelle". Vibe. June 27, 2017. Retrieved June 30, 2017. ^ "Dave East Reveals Tracklist for 'Paranoia: A True Story'". HotNewHipHop. August 16, 2017. Retrieved August 18, 2017. ^ "Brand New Scores First No. 1 Album on Billboard 200 Chart With 'Science Fiction'". Billboard. August 27, 2017. Retrieved August 28, 2017. ^ "A-Trak's Goldie Awards: Dave East to Host & More Details". Billboard. June 6, 2017. Retrieved June 30, 2017. ^ "Dave East Reps Harlem in His Version of Fat Joe's "All The Way Up"". Highsnobiety. April 11, 2016. Retrieved July 15, 2016. ^ "Dave East Echoes A Nostalgic New York Street Vibe On 'Hate Me Now'". TheRapfest. October 12, 2015. Retrieved July 15, 2016. ^ "Dave East - 2016 XXL Freshman Class". XXL. June 28, 2016. Retrieved July 15, 2016. ^ "Mass Appeal — Mass Appeal Issue 56: On Deck". Mass Appeal. June 15, 2015. Retrieved July 15, 2016. ^ "BABY SCOOP: Rapper Dave East Welcomes A Baby Girl". Ice Cream Convos. March 9, 2016. Retrieved July 11, 2016. ^ Miller, Kai (June 9, 2018). "Snoop Dogg and Dave East Rep Their Set in "Cripn 4 Life" Video". XXL. Retrieved February 5, 2019. ^ "The Beef Between Barry and Nikki Brews Over to Imani X and Dave East Makes His Debut on The Breaks". VH1. April 4, 2017. Retrieved November 27, 2018. ^ "'Wu-Tang: An American Saga': Julian Elijah Martinez, Dave East & Vinnie Pastore Join Cast Of Hulu Drama Series, Craig Zisk To Direct". Deadline Hollywood. March 5, 2019. Retrieved April 2, 2019. ^ "BMI Social Star Award 2017". BMI Awards. August 14, 2017. Retrieved August 27, 2017.